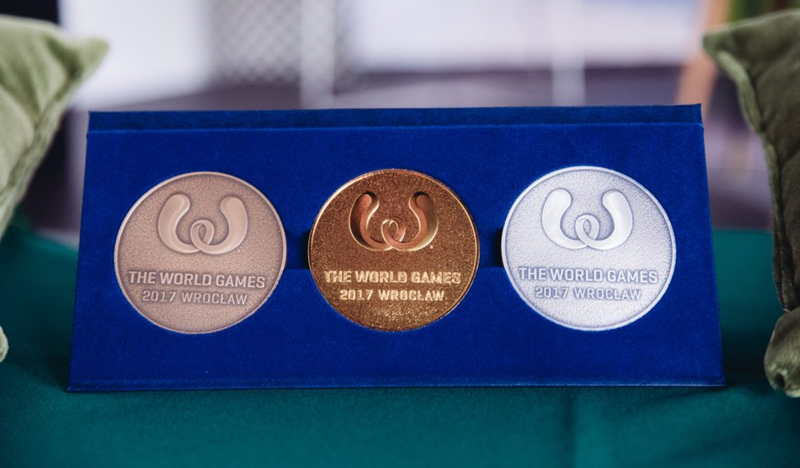 The 2017 World Games medals. Photo: TWG. After three days of intense competition in Wroclaw, Poland, ultimate’s medal ceremony for the 2017 World Games is now completed as the USA, Colombia, and Canada climbed the podium. Here are some assorted thoughts about the tournament and the teams. “Flying Disc” – aka ultimate – was held in a 55,000 seat National Stadium in Kaohsiung, Taiwan, at the 2009 World Games. At the 2013 World Games, Flying Disc was held in the 35,000 seat Estadio Olímpico Pascual Guerrero stadium in Cali, Colombia. At both events, when the crowd roared, you couldn’t hold a conversation; while coaching GB in Cali against the hosts, we had to huddle closely on the line so the team could hear me talk such was the roar of the crowd. The atmosphere was incredible and unlike nothing I’ve ever experienced as a player before or since. By contrast, the temporary stands at the 2017 Wroclaw event held a tiny fraction of the number of spectators (I can’t find any accurate figures but maybe a few thousand), and while they were close to full for the finals, the overall atmosphere was totally different; the silence as the USA team walked to the line after being broken in their first game against Colombia was in complete contrast to the cacophony of 2013. This was my first World Games as a spectator. As a player and then coach, I experienced incredible levels of service from the host city and felt for a few days what life must be like as a professional athlete. I hope that the 2017 players experienced the same. My experience was of a less well-organised event; purchasing a ticket on day one took a staggering 15 minutes (fortunately there were only four people in the queue), and the catering setup was practically non-existent: most people relied on the local kebab house/pizza shop for food. Still, it was easy to get to the fields on public transportation, and the lack of crowds meant it was easy to watch the games from (slightly) elevated seating. The pitch was causing a lot of players difficulty from day one. There was rain overnight before the first day of play, so the fields were still slick when the first games started, and I lost count of the number of players who lost their footing over the next few days; it happened in every game and to a variety of players. By the end of the tournament, the pitch had some divots but drained incredibly well after the deluge a few hours before the final. The Polish team’s coaching staff did a good job of getting the crowd cheering and clapping along with their team chats, or stamping their feet to rattle the metal stands. Aside from that, the atmosphere was fairly quiet, more like a regular ultimate event than a showcase event only held once every four years. Not getting to play in the stadium was obviously a factor in this, and the World Flying Disc Association and USA Ultimate should fight hard to ensure that ultimate gets pride of place in the stadium at the 2021 games in Birmingham, Alabama. Day one featured some really scrappy ultimate. There were lots of simple turnovers, teams struggling with miscommunication errors, or drops that are not common in world-class play. My overall feeling at the end of Friday was that the playing level was lower than in Cali four years prior. The host nation on this occasion was the relatively inexperienced Poland, compared to the formidable Colombia, and a few teams were certainly not at their best, with the controversy over the Buzz Bullets exclusion causing substantial negative changes to the Japanese roster, and some late dropouts from the Australians. But still, the high end of the quality on display was just as good – if not better – than it had been in the past. It was the lack of consistency that stood out, with some teams racking up dozens of turns in each half yet still playing sublime ultimate at times. The only team who seemed to get it right was Colombia, who sat at 4-0 after four games; the 6-0 run they yielded to the USA in the middle of their round robin matchup was the notable wobble in an otherwise perfect first two days. By Sunday, the quality was sensational. Australia played incredibly well to defeat Colombia, going out hard to a 5-0 lead against a team you could tell would prefer to be resting for the final. Canada played tremendously all day, first beating Japan comfortably (8-1 half) then defeating Australia in the bronze game, giving up just three turnovers by the time the game reached 12-10. I genuinely felt sorry for the Crocs, who came up against a Canada team that was peaking at the exact right time. So why the sudden increase in quality? The wind wasn’t really a factor in any of the games, and even a bit of rain wouldn’t have slowed down teams at this level. Maybe the additional pitch time in the first two days helped the teams to gel, or maybe players had relaxed into the occasion or gotten over their jet lag. Whatever it was, teams seemed to be firing on all cylinders by day three. Again, Colombia seemed to be the odd ones out, going 5-0 down to Australia on Sunday morning in a game they didn’t need to win yet were definitely applying themselves for; deep down, they’d have known it didn’t matter, yet pride is a strong motivator and coming off a good win would set up their confidence going into the gold medal game. Instead, they just wasted precious energy and looked more sluggish than usual in a game against a well-rested USA, whose early game against Poland had been abandoned due to a significant rain storm. Playing a long, hard game against a resurgent Australia certainly wouldn’t have helped Colombia’s energy levels. Poland relied heavily on their big male handlers Filip Dobranowski, Filip Stepniak, and Wojtek Starzewski. They tended to stack very deep with their women, relying on creating space in front of the disc for aggressive handler cuts, then hitting their women for continuation scores. Their tactics were very one-dimensional and this, along with their overall lower skill level, meant that they really struggled to play at the World Games, a much higher caliber tournament than anything they’d have seen in Europe. Japan had some wonderful handler movement, particularly around Ayumi Fujioka & Kenjiro Kawase, aggressively setting up power position with accurate around breaks. Japan also had easily the most precise deep throws of anyone at the tournament. However, their high risk, high reward tactics just didn’t pay off for them at a tournament with small rosters; their insistence on playing only the unders meant that they had to work really, really hard to get open on every cut, and they looked exhausted. They certainly struggled on the turn to get the disc back: their zones were largely ineffective with the lack of wind or rain. Their only win came vs. a Poland team that insisted on hucking through their zone, with predictably mixed results. Australia played a very slow, static game of ultimate, largely out of a vertical stack with some occasional horizontal allowing their four women to cut. Cat Phillips was basically unstoppable: as a pro Aussie Rules football player, it was interesting to see what the next level of athleticism looked like, and let’s just say that it was a big step up. It was perhaps a hint of what the future holds for ultimate. Australia distributed the disc well and made good use of all their players, relying on male deep cuts from handler positions to draw poaches, then hitting the poached players and often switching their style from slowly picking off one throw at a time to suddenly flowing at breakneck speed. One area in which they struggled was the fast break, as they failed to distribute the disc and often turned it over immediately after picking up. They also had a tendency to hang their deep shots, something the USA abused. Australia’s gender-agnostic zone set was of particular interest, working very well against Colombia but proving largely ineffective against the USA & Canada. I thought Rebecca Brereton and Rob Andrews had a very good tournament for youngsters stepping in late. Canada played a very nice style of ultimate, possibly the best in terms of teachable tactics, but simply lost out in terms of individual skill against the top two. An incredibly tight game vs. Colombia showed how close Canada was to a bid for silver, and they defeated all other teams except the USA. Canada regularly scored in under three passes with some great set plays, and they proved to be incredibly well skilled at taking advantage of the separation provided by those plays. Classic stuff straight from the textbook. Despite some controversy over a late call in the bronze game, I saw Canada play with great spirit, regularly discussing things politely and with respect, even hanging around after that tough loss to Colombia to teach volunteers to throw and take photos with fans. They were another balanced team. Kudos Canada. Catherine Hui or Mark Lloyd for MVP, I can’t decide. A few years ago, Colombia had a reputation for being all about the big plays, playing a high risk style that looked spectacular but rarely achieved results. How things have changed. Can they still play spectacularly? Hell yeah. Talk about clutch: they beat USA 13-12 from 12-10 down, scored Callahan goals in the majority of their games, and made immense plays to secure victory over Canada. Name names…ok, but I’m just going to do someone an injustice. Yina Cartagena was possibly the best women at the tournament. Manuela and Valeria Cardenas were simply unbelievable: a personal highlight was clearly the double game point layout block by Valeria vs USA, catching the game-winning point two passes later. Along with Laura Ospina, these ladies chewed up yards for the Colombian offense, picking other teams apart. Santiago Montaño anchored the offense, always cool, and combined with big athletes like Julio Duque, Andres Ramirez, Elisabeth Mosquera and Esteban Ceballos. Colombia had a lot of weapons and was another fantastically balanced team. Their style, though, was slightly unusual, as they played with a heavily skewed stack with everyone very close to the disc, focusing on isolations near the sideline. You’d think that the solution to this would be to poach, but you’d be wrong, just as the USA found out in their first match. I think Colombia scored more easily against poaching than against any other type of defense. The true weaknesses were revealed in the final when, against a hard person defense, Colombia no longer trusted their leading passes to their women and just couldn’t generate the kind of separation that they had previously against an admittedly better rested Team USA. Colombia won’t be happy with their performance in the final, but then again there are plenty of other teams that have reached a final against the USA and felt that they’ve underperformed. Maybe there is truth to the idea that the USA knows how to play better in the big games? Despite entering as the defending champions and everyone’s favorite coming into the tournament, the USA was surprisingly poor at the start of the weekend, making lots of simple mistakes and, frankly, looking a little nervous against Colombia in their opening game. It took a defensive run for them to get their confidence back, but honestly their offense didn’t look great until the final. There, they consistently scored down the sideline, trying to avoid the Colombian poaches, and it worked very well as the Colombians failed to adjust. As a team, I don’t think they played a well-balanced game, relying a lot more on certain players than others, and were often guilty of looking off wide open women. Perhaps this was a deliberate offensive adjustment following their opening game loss, as it often looked like USA would catch the disc, wait, scan for poaches, wait some more, then finally hit the pass or look to swing. This slow, cautious style worked particularly well in the red zone, with USA showing much better patience than any other team, although they were rarely able to score as smoothly or efficiently as Canada, with lots of wayward throws reeled in by huge athletic catches that may literally have been the deciding factor as to which was the best team at this tournament. The gun-slinging approach in the final certainly worked very well, although if some of the more spectacular catches (Griffith’s or Kocher’s spring to mind) didn’t work out, then perhaps the game would have been much closer. Without a doubt, though, the deciding factor was constant, oppressive, smothering defensive intensity that USA regards as its bread and butter. Better athletes, better positioning, better communication, and better able to take advantage of mistakes. That’s the difference between gold and silver. Yet again it is the USA that shows how it’s done. The USA game against Poland (which had no bearing on the outcome of the tournament — the USA had already clinched a spot in the final) was canceled due to the heavy rainstorm and what would have required a big shift in timing for the bronze and gold medal games, for which tickets had already been sold. Surely it was not an easy decision, as the Polish wanted to play the game and the Colombians had played earlier against Australia in a similarly unimportant game. It may have been meaningless in terms of table placement, but both Australia & Colombia wanted to hit their placement games with the air of confidence that a victory brings. Australia zoomed out to a 3-0 lead and forced a Colombia time out. It didn’t help, as Australia converted two more breaks and eventually took half 7-2. Colombia started to make things interesting in the second half when they notched back to back breaks after Ospina snagged one and a big pull stifled the Australian offense, setting up another to make it 11-8. Australia’s strong under cutting delivered a hold on the following point, but Colombia answered back and then broke after high pressure defense forced an errant flick. Colombia converted to make it 12-10. They would have another opportunity for a block on the following point, but Cartagena jumped too early and Tom Tulett reeled in the game winner. Canada played Japan on Sunday morning and jumped out to a quick 3-0 lead thanks to good defense on some poor reset throws from the Japanese. The strong defense continued to pour it on and the Canadians took half 7-1 as the Japanese cutters just could not get open against the taller, more athletic defenders marking them. After a drop from Japan allowed another quick Japanese score, both offenses started to look good. Japan dropped in an “over the back of your defender’s head” blade from Fujioka, then Canada’s Tim Tsang launches a 70 yard backhand that was hauled in by Hui. Canada’s offense just wouldn’t slow down — previewing their great performance in the bronze medal match — and Lloyd found Laura Mason deep for the 13-6 win. Comments on "World Games 2017: Closing Thoughts, Play Styles, And Atmosphere"